This summer marks the 22nd anniversary of my bike ride across America. Several Health & Healing subscribers joined me on the more than 4,000 mile trek that started in Washington state and ended on the steps of the Supreme Court in Washington, DC. Back then I wrote an article stating that I hoped to complete the ride without a scratch, bump, or cut. However, I planned to be prepared with a few first aid supplies in case I or one of my fellow riders took a tumble. The items I packed are ones I recommend to this day. Whether you are hiking, biking, or traveling over the next few months, it’s a good idea to pack a summer first aid kit. 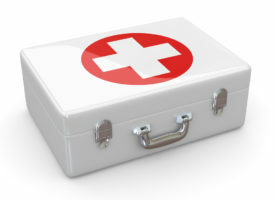 Here are a few of my favorite first aid items. First Aid Item #1. Ice. Well, obviously it’s not actually in the first aid kit, but ice is the number-one therapy for many injuries, including sprains, bruises, insect bites—anything that involves inflammation or swelling. First Aid Item #2. OxyRub. OxyRub, a topical preparation of menthol and a proprietary oxygenated essential oil, provides quick relief for sprains, strains, bumps, and sore muscles. First Aid Item #3. Arnica. This homeopathic ingredient is great for alleviating pain and shortening the healing time of blunt trauma injuries, such as bruises and bumps, as well as sprains. First Aid Item #4. DMSO. I’ve been using topical dimethyl sulfoxide (DMSO) for decades. When this sulfur-rich compound is applied topically to the skin over an aching joint, it rapidly passes through to the tissues below, where it dampens pain and inflammation, scavenges free radicals, and speeds up healing. It’s also great to use along with OxyRub and Arnica ointments because it enhances their absorption and effectiveness. First Aid Item #5. Hydrogen peroxide. Nothing cleans a cut or scrape like hydrogen peroxide. Wash the wound first with soap and water, and then pour a little hydrogen peroxide on and watch it bubble. Remember that hydrogen peroxide loses its efficacy with time, so replace the bottle regularly and only purchase brands sold in dark containers. First Aid Item #6. Sugar. Yes, sugar. Build up a little wall around the edges of an open wound with petroleum jelly, sprinkle sugar on the wound, and cover with a dressing. Sugar draws fluid from the wound and helps kill bacteria. Do not use on bleeding wounds. First Aid Item #7. Band-Aids, gauze and tape. Most small, superficial scrapes and scratches should be cleaned and left open. Obviously, deeper wounds need to treated with an antibacterial ointment and covered, but don’t make a habit of putting a Band-Aid on every little nick or cut. First Aid Item #8. Calamine lotion or aloe vera gel. For insect bites, sunburn, and poison oak or poison ivy, either of these is very soothing. First Aid Item #9. Aspirin, acetaminophen (Tylenol), or ibuprofen. To be clear, these over-the-counter pain relievers should never be used regularly due to potentially serious side effects. However, acetaminophen is helpful for occasional headaches, and NSAIDs (aspirin and ibuprofen) reduce inflammation and minor aches and pains. First Aid Item # 10. DGL (deglycyrrhizinated licorice). I keep this on hand for gastrointestinal distress, upset stomach, and heartburn. For chronic conditions, chew a tablet 20 minutes before meals, or take as needed. DGL often provides quick and lasting relief. 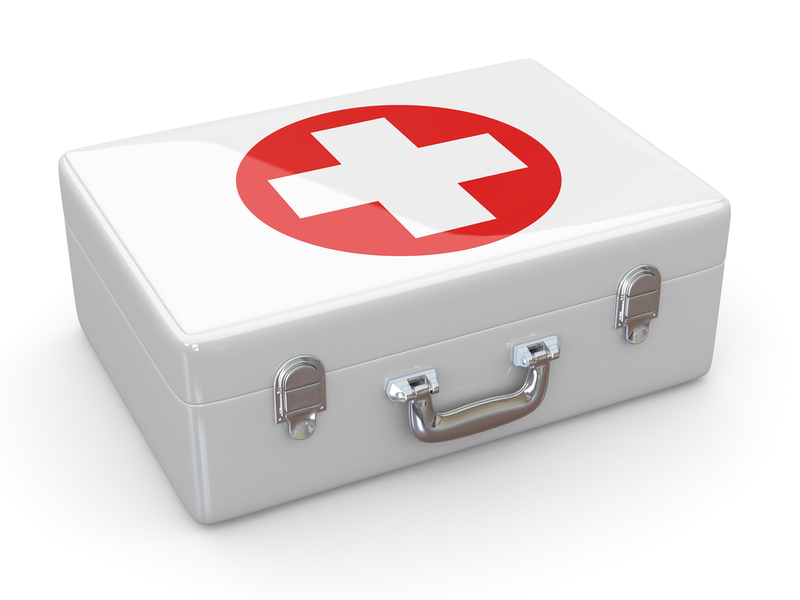 These first aid kit items can be found in drugstores, health food stores, online, or by calling 800-810-6655. Happy trails and I hope these summer first aid kit recommendations are useful if you need them. Summer is the time when many armchair athletes become weekend warriors, only to regret it on Monday when they wake to stiff muscles and creaking joints. But summertime sports activities needn’t leave you limping, provided you take care of your injury early. Experts agree that the first three days are a window of opportunity for rapid healing. First aid for any type of musculoskeletal injury starts with RICE (rest, ice, compression, and elevation). Rest doesn’t mean bed rest, which actually promotes stiffness and slows recovery, but avoiding vigorous activity that involves the injured area. Ice the injury early and often for 15-20 minutes at a time. Compression with an elasticized cloth bandage will minimize swelling, as will elevation of the injured area above the level of your heart. Serious injuries should be evaluated by a doctor.